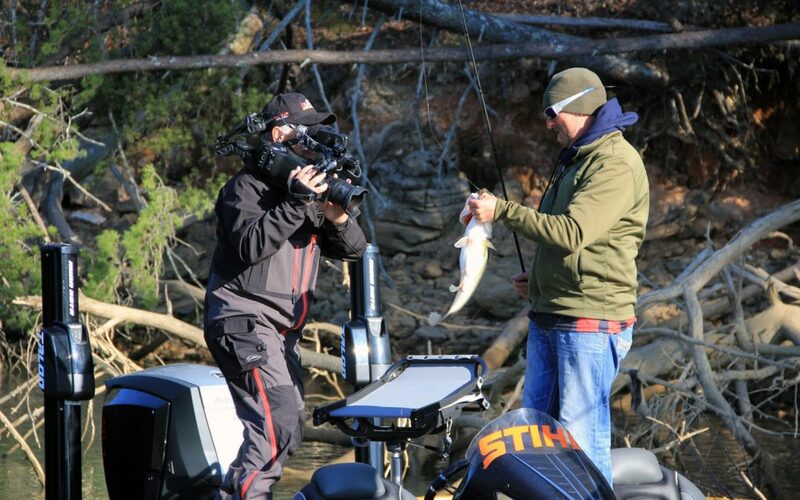 Shooting the Outdoor Channel’s Ultimate Match Fishing at Bluewater in Dayton TN. It’s been challenging lately to know where show business ends and everyday leisure begins. Pelican’s Ultimate Match Fishing recently returned to shoot a second consecutive season at Bluewater Resort & Marina from April 10-17. 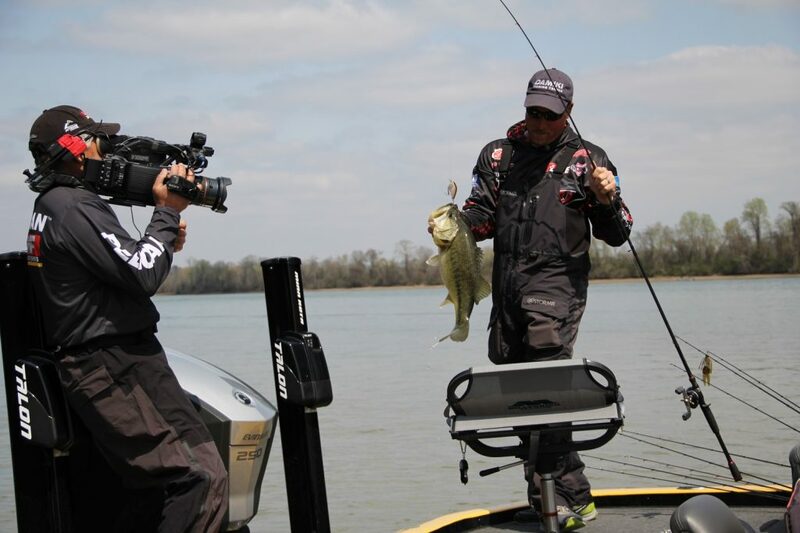 Cameras were rolling as top anglers faced off under the UMF format against leading FLW Tour and Bassmaster Elite Series Pro competitors to try and pocket a $20,000 Grand Prize. Did Dave Lefebre successfully defend his title? Viewers will have to tune in when episodes air on the Outdoor Channel to find out. The final day of the UMF Invitational airs exclusively on MOTV, aka “MyOutdoorTV”, a streaming app for outdoor programming. Outdoor Channel is received by nearly 40 million U.S. households – the largest outdoor TV footprint in the country – and is available in more than 50 countries internationally. 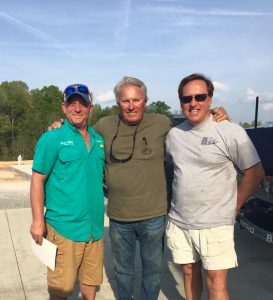 Legendary fisherman and TV host Roland Martin is just one of the faces you might recognize if you happen to stay at Bluewater. Another is Larry Edwards, a Coca Cola employee who was included, along with wife Jen, in the MTV special “Being The Edwards”. They were a popular part of the reality show “Teen MOM OG”, about strained family and romantic relationships in the first years of adolescent motherhood. Their son, Ryan, is one of the young fathers on the show with Chattanooga resident Maci Bookout McKinney. In this clip from the special, Larry and Ryan can be seen at Bluewater, sitting at a picnic table outside an RV, discussing Ryan’s living arrangements and working on a fishing rod. Filming schedules aren’t always publicized to prevent disruptions from the normal schedule. Even without publicity, Barron Wilson of Bluewater said the spotlight attracts attention. “People visit and ask, ‘Is this where they filmed ‘Teen Mom’?” he said. It’s not every day you get to meet a legend like Roland Martin. Most recently, the CBS Morning Show was at Bluewater to film a segment on the rapid growth of Rhea County, Tennessee. Why so much interest in Bluewater and Dayton? 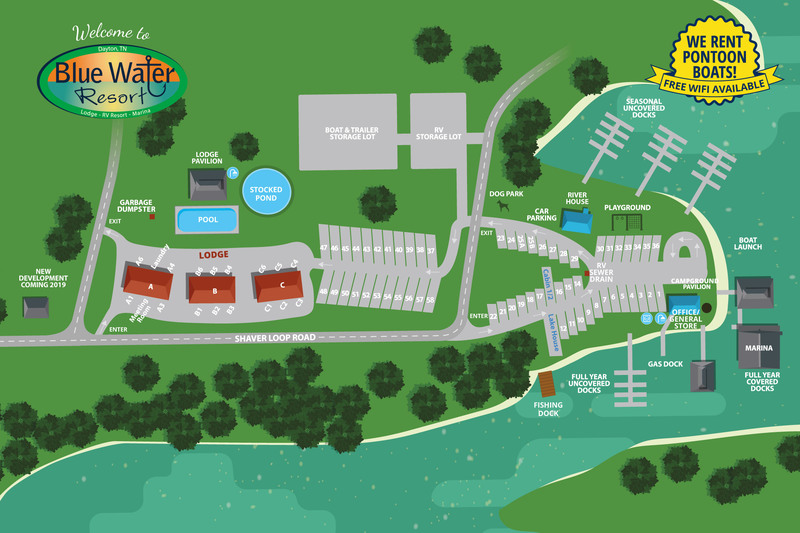 Perhaps it is the combination of natural scenic beauty and rare, easy access to a photogenic body of water, with the new Lodge providing an important piece of the puzzle when it comes to high quality accommodations for casts and crews. 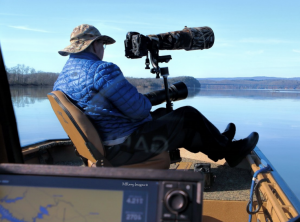 Wilson said the Rhea County Economic and Tourism Council deserves credit for focusing on marketing the area to sportsmen and pursuing tournaments. It has translated into national attention via the entertainment industry and an economic impact on local businesses like Bluewater. What’s next for the resort and marina that TV cameras seem to love? Continued improvements to the property, including the addition of a pool and new open-air gazebo, in the short term. Whether the focus is on outdoor sports, families gathering or economic development, Bluewater sets the stage for an experience worthy of recording.